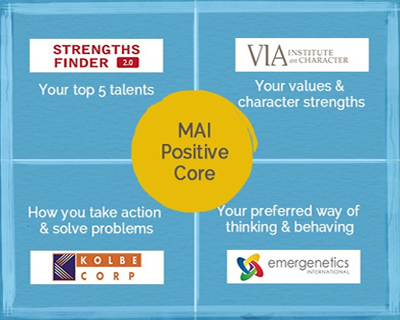 Includes all 4 MAI Positive Core™ assessments, MAI Positive Core Summary™, access to 4 hours of video content (available 24×7), two 30 minute coaching sessions with an Authentic Impact coach and an Individual Development Plan. Two 30 minute coaching sessions with an Authentic Impact Coach to help use the results effectively. In these sessions you and your your coach will work together to create an Individual Development Plan, summarizing how you can best leverage MAI Positive Core™ to achieve the results you are seeking personally and in your career. 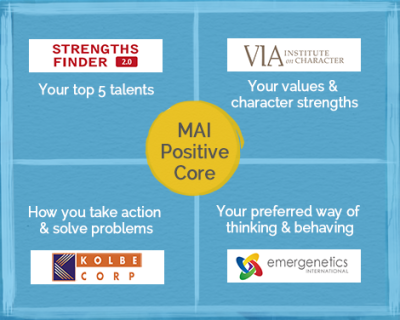 MAI Positive Core™ combines the results of four highly respected assessment tools to create a comprehensive and actionable picture of you…at your best. The results are empirically sound and intuitively correct. It provides an immediate understanding of how you prefer to work and communicate and provides effective language to describe yourself. You receive insight into how you might be perceived by others, and gain clarity on why others might behave the way they do.